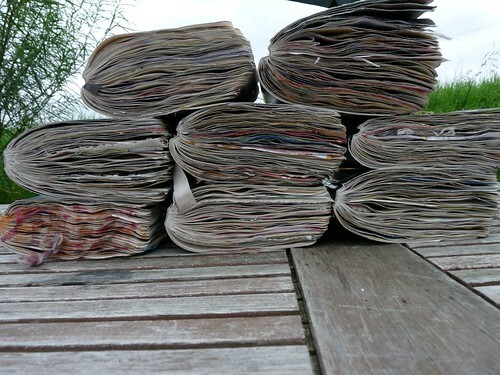 September, 21 and Seth from the altered page came up with the lovely idea of posting a picture of some paper stacks. These are my "wreck this journals", I have made 8 of them in two years (working on #9 now). Of course I am not following the rules inside the books when doing it now, but I use them as my "safe playground" for doing art without any purpose. They are the perfect gift for my inner child, that just loves to play. Everything is possible in them and they are filled to the brim with papers, scraps, cuttings, colours, dried flowers, found things and memories. You can read more about Seth's idea on his blog. And it's also bag day! Do you remember? It was on September, 21 2009 when I started my first international project "One tribe-one (he)art" with 12 bags and 12 people and 12 artful prayers for world peace. 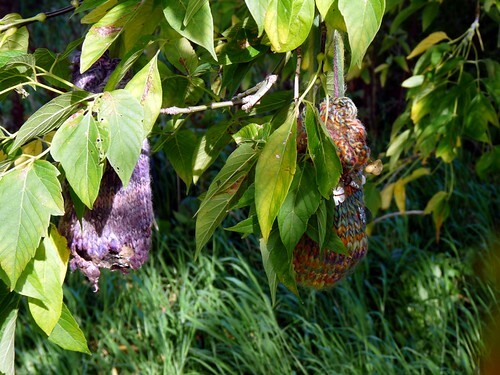 The bags hang in the great tree in my garden, exposed to the elements, through winter snow and summer sun, rain in spring, stormy nights in autumn. It's some Buddhistic thought about it, that even if things decline, their spirits are still there and the wind will carry them far. Sensational shot of your journals. I love how you are 'going outside the lines' and doing whatever you like within there pages. Nice to visit the 12 bags as well. After 2 years I actually think they have held together pretty well. those are some really fat art journals...great stack. Love what you wrote about the Buddhist idea of letting go ... creating art journals is a beautiful way to let go of feelings and more! Great project and my how the time flies!!! those great big journals make my heart beat faster! they are so fat. i love seeing big ole journals just bursting like that. and your 12 bags are lovely, each full of spirit and joy. 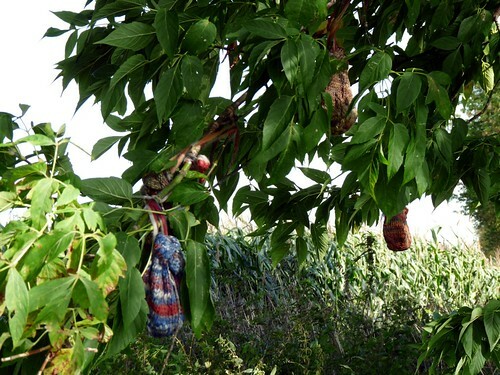 such a wonderful idea to create such blessings right in your own back yard. Great stacks!!! 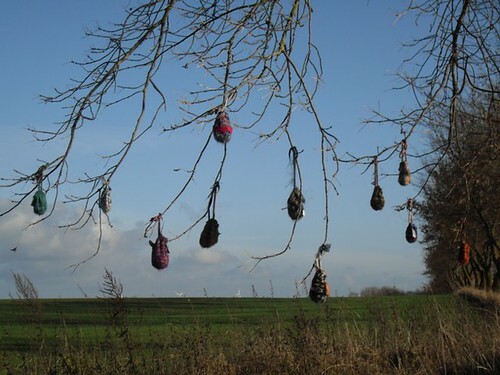 ... but I really love your tree bags... uplifting idea. Oh, the journals are fabulous! And the bags are so amazing! i just LOVE your stack of journals -- they look so loved and full of wonderful things. your bags are divine too! Fantastic paper stacks. 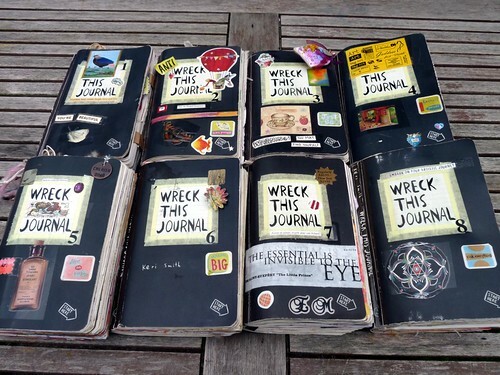 I love the grungy look of your journals. I LOVE that you let your Muse run wild!!! Gorgeous stack photos. Very inspirational with the tree too. Amazing stacks! I can't get over how you have stuffed the same book full eight times over! I would love to have a look inside. Look at those fabulous journal books! They are gorgeous looking and so glad you make your very own art playgrounds- what a gift. Also love your one tribe one heart bags. 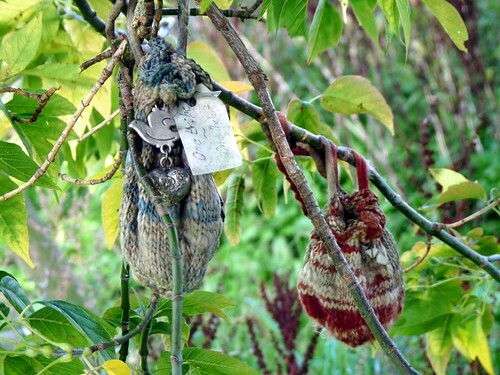 They look weathered and so at peace- they will always carry the prayers and spirits of all those who sent them to you! Just magical! Oh I love your wreck's, big chunky books with lots to sift through. What a treat - those journals are plump and full bursting with creativity and freedom! So inspiring! Somehow I managed to find your site, although I had trouble with Seth's link. I have never made one of those journals, but they look like a lot of fun. And they look like they hold a lot of interesting visuals, too. The bags, about to give their lives to the elements, seem rather appropriate as winter beats down on us soon. holy cow those journals are insane. love! i would like to see what is inside!